Here, Clevers talks about promoting a collaborative spirit in research, the art of doing a pilot experiment, and growing miniature organs in a dish. Opportunity to travel. “I was very disappointed in my biology studies, which were old-fashioned and descriptive,” says Clevers. He thought medicine might be more interesting and enrolled in medical school while still pursuing a master’s degree in biology at Utrecht. For the master’s, Clevers had to do three rotations. He spent a year at the International Laboratory for Research on Animal Diseases (ILRAD) in Nairobi, Kenya, and six months in Bethesda, Maryland, at the National Institutes of Health. “Holland is really small, so everyone travels.” Clevers saw those two rotations more as travel explorations. In Nairobi, he went on safaris and explored the country in Land Rovers borrowed from the institute. While in Maryland in 1980, Clevers—with the consent of his advisor, who thought it was a good idea for him to get a feel for the U.S.—flew to Portland, Oregon, and drove back to Boston with a musician friend along the Canadian border. He met the fiancé of political activist and academic Angela Davis in New York City and even stayed in their empty apartment there. On a mission. “Once I decided to become a scientist, I knew I needed to train seriously. Up to that point, I was totally self-trained.” From an extensive reading of the immunology literature, Clevers became interested in how T cells recognize antigens, and headed off to spend a postdoc studying the problem in Cox Terhorst’s lab at Dana-Farber Cancer Institute in Boston. 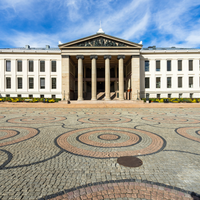 “Immunology was young, but it was very exciting and there was a lot to discover. I became a professional scientist there and experienced how tough science is.” In 1988, Clevers cloned and characterized the gene for a component of the T-cell receptor (TCR) called CD3-epsilon, which binds antigen and activates intracellular signaling pathways. On the fast track in Holland. 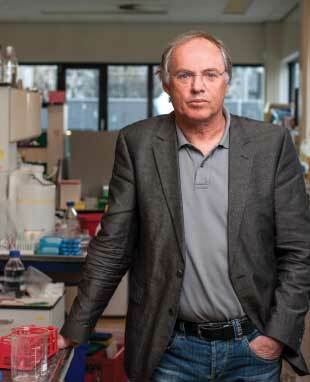 Clevers returned to Utrecht University in 1989 as a professor of immunology. Within one month of setting up his lab, he had two graduate students and a technician, and the lab had cloned the first T cell–specific transcription factor, which they called TCF-1, in human T cells. When his former thesis advisor retired, Clevers was asked, at age 33, to become head of the immunology department. While the appointment was high-risk for him and for the department, Clevers says, he was chosen because he was good at multitasking and because he got along well with everyone. Trial and error. Clevers’s lab found that while TCF-1 bound to DNA, it did not alter gene expression, despite the researchers’ tinkering with promoter and enhancer assays. “For about five years this was a problem. My first PhD students were leaving and they thought the whole TCF project was a failure,” says Clevers. His lab meanwhile cloned TCF homologs from several model organisms and made many reagents including antibodies against these homologs. To try to figure out the function of TCF-1, the lab performed a two-hybrid screen and identified components of the Wnt signaling pathway as binding partners of TCF-1. “We started to read about Wnt and realized that you study Wnt not in T cells but in frogs and flies, so we rapidly transformed into a developmental biology lab. We showed that we held the key for a major issue in developmental biology, the final protein in the Wnt cascade: TCF-1 binds b-catenin when b-catenin becomes available and activates transcription.” In 1996, Clevers published the mechanism of how the TCF-1 homolog in Xenopus embryos, called XTcf-3, is integrated into the Wnt signaling pathway. 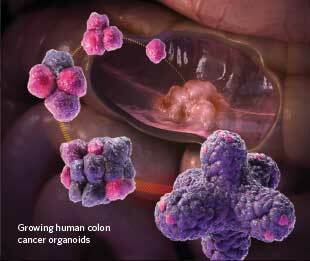 COURTESY OF HANS CLEVERS AND JEROEN HUIJBEN, NYMUS 3DCrypt building and colon cancer. Clevers next collaborated with Bert Vogelstein’s lab at Johns Hopkins, linking TCF to Wnt signaling in colon cancer. In colon cancer cell lines with mutated forms of the tumor suppressor gene APC, the APC protein can’t rein in b-catenin, which accumulates in the cytoplasm, forms a complex with TCF-4 (later renamed TCF7L2) in the nucleus, and can initiate colon cancer by changing gene expression. 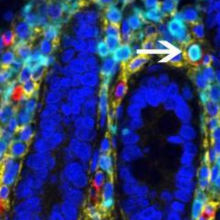 Then, the lab showed that Wnt signaling is necessary for self-renewal of adult stem cells, as mice missing TCF-4 do not have intestinal crypts, the site in the gut where stem cells reside. “This was the first time Wnt was shown to play a role in adults, not just during development, and to be crucial for adult stem cell maintenance,” says Clevers. “Then, when I started thinking about studying the gut, I realized it was by far the best way to study stem cells. 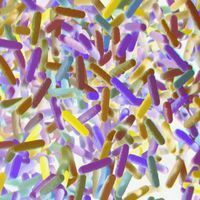 And I also realized that almost no one in the world was studying the healthy gut. Almost everyone who researched the gut was studying a disease.” The main advantages of the murine model are rapid cell turnover and the presence of millions of stereotypic crypts throughout the entire intestine. On to organoids. 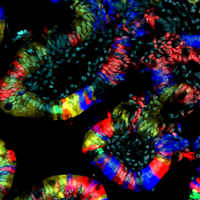 Once the lab could identify adult stem cells within the crypts of the gut, postdoc Toshiro Sato discovered that a single stem cell, in the presence of Matrigel and just three growth factors, could generate a miniature crypt structure—what is now called an organoid. “Toshi is very Japanese and doesn’t always talk much,” says Clevers. “One day I had asked him, while he was at the microscope, if the gut stem cells were growing, and he said, ‘Yes.’ Then I looked under the microscope and saw the beautiful structures and said, ‘Why didn’t you tell me?’ and he said, ‘You didn’t ask.’ For three months he had been growing them!” The lab has since also grown mini-pancreases, -livers, -stomachs, and many other mini-organs.